In February 1999, four New York Police Department plainclothes officers in the Bronx fired 41 shots at 22-year-old Amadou Diallo, who was only armed with his wallet and a beeper. He was struck 19 times. Two of the officers didn’t stop firing their weapons until their 16-bullet cartridges were empty. It was a painful reminder of how little some things have changed. Seven months later in Queens, Serena Williams won the U.S. Open, becoming the first African-American woman to win a major tennis title since Althea Gibson in 1958. It was a beautiful reminder of just how much things have changed. For over 20 years now, sisters Venus and Serena Williams have been a crucial wrinkle in the fabric of the black national dialogue. More than the matches, records, titles, more even than their iconic status, the Williams sisters have been a reset button. Bills could be overdue, car in the shop or out of the shop but no gas in the tank, mention Venus and Serena and pride fills the heart and a smile stretches across the face. Sure, there have been other great sports icons that could spark conversation. What makes the sisters different is that they were dominating a sport that had not seen an African-American major champion since Arthur Ashe won Wimbledon in 1975. A sport that had never seen a black woman ranked No. 1 before Venus did so in 2002. A sport two girls from Compton, California, were not supposed to be playing, let alone dominating. And they did so without apologizing for their blackness. 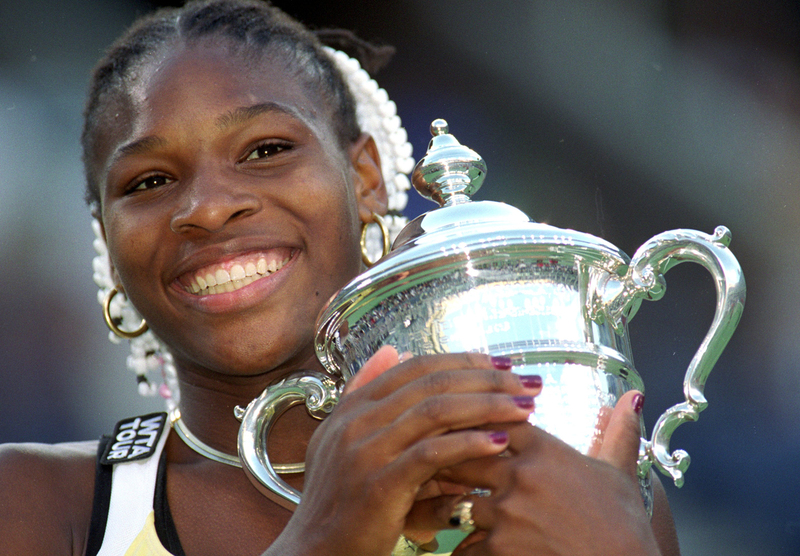 A close-up of Serena Williams as she poses with her trophy after her match with Martina Hingis of Switzerland in the 1999 U.S. Open at the USTA National Tennis Center in Flushing Meadows, New York. Williams defeated Hingis 6-3, 7-6 (7-4). Even today, some 17 years after Serena beat then No. 1 Martina Hingis to win her first major in the shadow of Diallo’s murder, she and Venus played in Thursday’s semifinals of Wimbledon in London while police killings in Louisiana and Minnesota have sparked protests and dominated headlines back home. We weep over what appears to be another example of black lives not mattering while also holding hope that the sisters win. And while Venus fell a little short, Serena will be going for her record-tying 22nd major on Saturday. How long have the two been inspiring us? Well, since 1999 a Williams has won a major every year except for three. Apparently #BlackGirlMagic is more than just a mantra. This is not to suggest the sisters play so black folks have something good to talk about. I’m only noting that when they do play, we watch and smile. The size of the audience tuned in for the Wimbledon final in 2015, when the younger sister captured her second “Serena Slam” (winning four straight majors), was twice that of 2014, which did not feature a Williams sister. Every major final in 2015 saw an increase in audience size because of Serena with the exception of the U.S. Open, which she did not play in. The sisters’ 2015 viewership impact — with the Walter Scott shooting and controversial deaths of Sandra Bland and Freddie Gray in the backdrop — illustrates their ability to help us forget the pain … if but for a little while. And we’ve tried to be there when they were attacked — jeers about the beads at the end of their braids, the shape of their bodies, their aggressive style of play, all have been subject to attacks sometimes from other players. A newspaper in London, in reference to a match featuring Serena read “Beauty vs. the Best” and the word “beauty” was not linked to her. When they decided to boycott the Indian Wells Masters tournament after being booed and allegedly called the N-word in 2001, we got it. When they decided to return, we got that, too. “The undercurrent of racism was painful, confusing and unfair,” Serena wrote in a column for TIME magazine about her 2015 return. “In a game I loved with all my heart, at one of my most cherished tournaments, I suddenly felt unwelcome, alone and afraid.” Venus, who returned in 2016, wrote in an essay for The Players’ Tribune, “I remember how the coverage of it at the time didn’t seem concerned with me and Serena, as people, at all.” Their father, and one-time coach, Richard Williams, said he had trouble holding back his tears. It makes all the sense in the world that Serena would join the mothers of murder victims Michael Brown and Trayvon Martin in musical artist Beyoncé’s visual album and homage to black women, Lemonade. For 20 years, she and her sister have been among the most famous black women in the country. They have endured racism and slights and all of the ugliness this culture can sometimes throw at minorities and yet, they are back at Centre Court with all eyes on them.